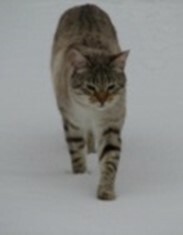 We have two Snow Bengals called Tora and Schrodi. They are brothers from the same litter, and though it is hard to believe, they are nine years old now. That makes them middle-aged, which is fair enough, because so am I.
Tora is short for ‘Toraneku’ which is Japanese for ‘Tiger Cat’. I don’t really know why I named him that because really he should have an Indian name as he originates from Bengal (well actually he was born in Preston but he likes to keep in touch with his ethnic roots). Tora is a bit skitty with people he doesn’t know but is very loving to us. He does have one little peculiarity, in that although he was ‘done’ when he was twelve weeks old, he seems to have retained some characteristics of an entire male. He has a toy Bagpuss, with which he has what could only be described as an intimate, if not loving relationship. Watching him for five minutes would be enough to put the television program in a permanently different light. Schrodi is short for Schrodinger; named after the famous physics experiment with the cat in the box. He is possibly the cutetest, sweetest cat in the world, but if you viewed him as a D&D character, intelligence would be his dump stat (unlike his brother, he has never mastered opening doors or drinking from a water glass). He is great at catching mice and other small creatures (we have seen him on the roof of the house, having a try for bats), but he doesn’t understand that he is supposed to kill them and eat them, so nine times out of ten he brings them alive into the bedroom in the middle of the night, and then lets them go under the bed. Generally I manage to release them intact. Both of the boys wear rather unusual and interesting collars which we ordered for them from California (www.thecatlocator.com). Many years ago, Tora was lost for three days and R and I nearly went out of our minds with worry. R found him shut in a neighbour’s house after the burglar alarm kept going off, but after that we decided to try to find a way to track their location. The collars contain a small wireless device which is tracked using a portable antennae. The range varies between about half a mile and a few hundred yards dependent on factors like obstacles between the collar and the receiver, and (to a lesser extent) atmospheric conditions, but it is adequate for the cats’ territory, and enables us know where they are. The collars are a bit pricy, but I’ve always been surprised that they haven’t caught on over here in UK, which possibly has the biggest concentration of dotty cat ladies in the world.